I just never thought I could make Hot Cross Buns but then I found them in our friendly Bread Machine Recipe Book and we got to work. There are a couple of steps but none of them are tricky. The process also takes a while, but yum worth the wait! With lashings of non (ahem) fattening butter. Step 1: You need to get a head start on the ingredients, a call for orange rind means you need a zester. 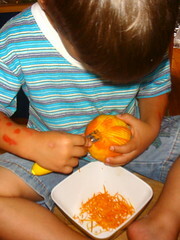 Our Zester is 4, he is well trained and also calls himself the Celebrity Chef. Good luck in finding your own one, this one isn’t for hire. 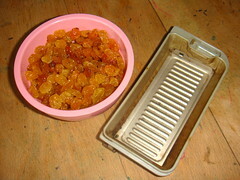 Step 2: Gather your ingredients and begin by placing your sultanas into the raisin dispenser. 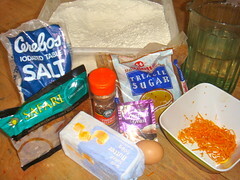 And then add all your other ingredients into the bread pan. 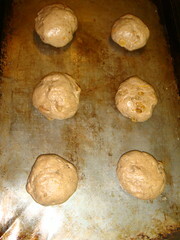 Step 3: Let your machine mix up a basic raisin dough. 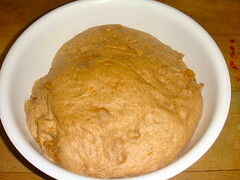 When its done turn it out into a greased bowl. Cover it and leave it to double in size for about half an hour. 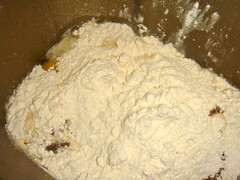 Step 4: Divide your mixture into twelve and roll them into buns and place on a greased baking tray. Cover them and leave them to rise for half an hour. 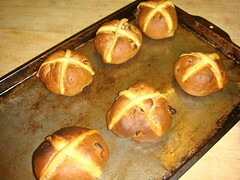 Step 5: While your buns are rising you need to make the crosses. 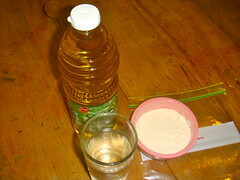 Mix 1/2 a cup of flour, 2 Tablespoons of oil together. 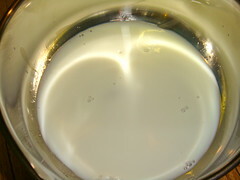 Add a dash of water, as necessary, to make a stiff paste. 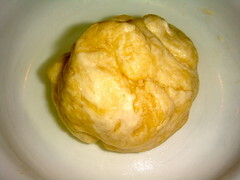 The idea is that you pop your paste into a piping bag or a ziplock with the corner off and march along your rolls making crosses. What actually happened is our bag kept breaking open so I rolled out little strips and made crosses. 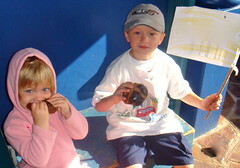 Lots of help was offered here – I knew there was a reason for having so many kids! 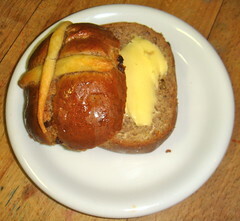 Two crosses each and the buns were ready to bake. 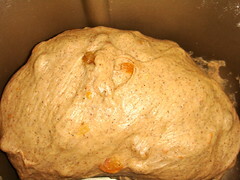 Step 6: Bake in pre-warmed oven at 200 degrees Celsius (400 degrees Fahrenheit) for about 20 minutes. 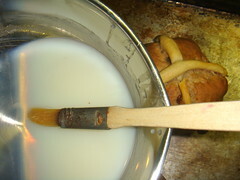 A skewer should come out clean… and your house will smell like heaven! 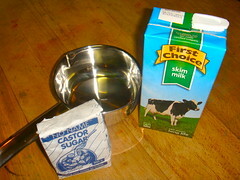 Step 7: While your buns are baking make a glaze with three Tablespoons of milk and three Tablespoons of castor sugar. Boil these together until you have a syrup. When they come out of the oven brush your buns with the glaze. That’s it. These were really really good, worth the wait… and I think they are about to appear on our daily menu for the next two weeks! And I will certainly think twice before buying some at the local supermarket!!! Yummy! 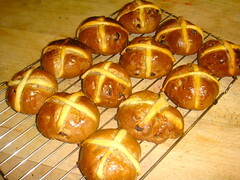 I saw the recipe as well and with Easter approaching I can hardly wait to make them. 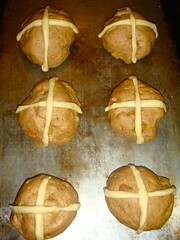 A trick I use, is to bake the buns and then make the cross on top with icing after they have cooled a bit. I know they won’t look as good as yours, but we eat them so fast, I’m not sure anybody notices. 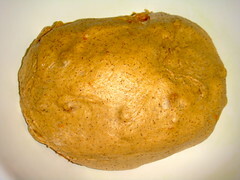 Hay Aunty K… I am so glad you are enjoying your bread machine!!! Just send some of your blueberry oatmeal bread down the internet. Thank-you very much!!! 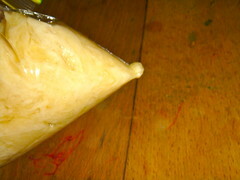 Hi L… These worked so well and they were really easy to make as well… My kids are dying to make them and the is huge competition to see who gets the next turn! I hope they work out really well for you!